Heart Two Heart with Dan and Ann is meant to ignite and inspire the listener to take their relationship with God to a new and deeper level. We want to explore with you subjects that are often skipped over and ignored but which add a rich dimension to humanity. We will unpackage and unravel such mysteries, maybe for the first time, most of which are found in our bibles. We will explore why the church is struggling to thrive in today's society and what needs to change; the mystical teachings of Jesus and Paul and men of recent past history who have made a difference in this world. We'll discuss modern-day miracles, the destruction that resentment has in our lives and in the church and the importance of speaking our truth in love. We will discover that we are unique aspects of God and as Jesus said of us, "you are the Light of the world"; and that we were destined to be ONE with Jesus and the Father today, not tomorrow, "for the kingdom of God is inside you and is at hand". We are advised by Paul of the bible to "let this mind be in you that was also in Christ Jesus" and by Jesus himself to "not marvel at the things that I do, for these and greater YOU will do". When? We are told that "In the latter days… your sons and daughters will prophecy, your young men will see visions and your old men will dream," but when? We believe in miracles – today – do you? These and many other such topics will be explored with you. If you have a question, curiosity, mystery, miracle or a story to share with us about your own individual experiential journey with God, you may be a good fit to be on our show and we hope to hear from you right away. Explore without fear with Dan and Ann on Heart Two Heart. ABOUT DANIEL CLARK - Daniel Clark has carefully studied and visited countless faiths and religions from around the world. He is an informal scholar of religious psychology, having thoroughly studied the works of well-known thinkers like David Hawkins, Wayne Dyer, Deepak Chopra, Marianne Williamson, Father Leo Booth, Father Thomas Keating, John Bradhsaw, Eckhart Tolle, and many others. He is actively involved in educating people about the dangers of religious repression and destructive cults. ABOUT ANGELA CLARK - Angela Clark is an Ordained Minister and has a passion for those who are struggling to thrive in life and seeks through education to lift them up - giving them the tools needed to be what they are meant to be. Angela taught Life Skills for 2 years and volunteers today working with inmates. She has enjoyed doing volunteer work throughout her life - with children and more recently with adult inmates. Having been through her own difficult challenges and struggles and then finding freedom, she is loving paying it forward. You will be able to listen to Heart Two Heart with Dan and Ann (H2H) at xzbn.net where you will also be able to view the complete XZBN broadcast schedule at xzbn.net. 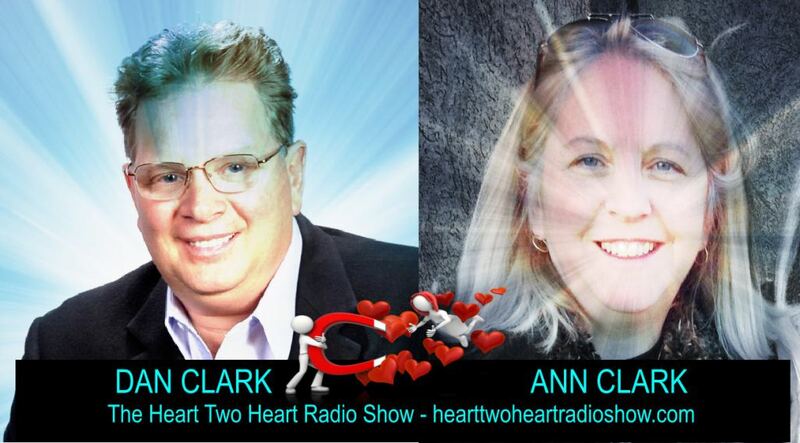 Heart Two Heart archives are available on the show website at http://www.hearttwoheartradioshow.com.